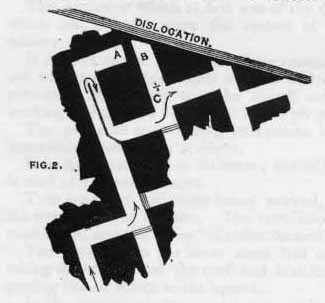 From Main body of report: There were three seams of coal worked at different levels off the shaft; there was a fixed scaffold constructed over one of the divisions of the pit, and the winding rope for that side reached no farther. The rope on the opposite side was used for winding from the upper and lowest seams, the cage being rested upon moveable boards termed "shuts," at the level of the upper seam when required. The preparatory work of turning the "pitbottom," stoop, &c., was going on in the upper seam. Deceased worked alone on one side, and the lever for working the "shuts" was situated on the opposite side; there was no road round the pit for him to get at it; and the only way he could get across the pit, unless when the cage was rested, was by walking on a "buntin" a few inches broad, between the cage guides and the column of pipes. The accident was occasioned by the deceased falling from the upper seam to the pit-bottom, a distance of 46 fathoms. I was engaged making an inspection of the colliery at the time the accident took place, but I did not discover why the deceased had been out of his working-place at the shaft, as he had no coals prepared for sending away, and his hutches were standing empty. A fellow workman engaged on the opposite side of the shaft explained that he had often seen the deceased leap across the pit, a distance of five feet, and the general impression was that he had been foolishly attempting to do so when the accident happened. I suggested to the proprietor that a roadway should be formed round the end of the shaft in the " upper seam," which was done without delay; and I understand that he has since arranged to make a weekly payment to the family of the deceased for a certain number of years. From Main body of report: This lad was engaged as a drawer, and during a partial stoppage on one of the horse roads a number of the boys had collected together, and were idling and playing. The unfortunate little fellow, who was attempting to get out of the way of his companions, crept through a small hole on the side of the main road (with his naked light") into an old and abandoned part of the waste, where a small quantity of firedamp had collected, and exploded it. He was slightly burned, and died a few days afterwards. From Main body of report: The deceased was a collier, and engaged in driving a " room" A, Fig. 1, forward upon an " end " or " crosscut " B. The " end " B had been worked forward to the position shown, about two months previous to the accident, and a small quantity of firedamp had collected in it. This appears to have been well known to the workmen in the immediate district. From Main body of report: In this case the unfortunate sufferer was engaged driving an "end" A to connect with a "plane" B which had been worked up to a dislocation and abandoned. For some reason he had gone into the " plane " B with his naked light, beyond the signal-board + C, and ignited the firedamp, which burned him severely. The deceased was well aware of the fact that firedamp lay in the abandoned "plane" B, and the fireman had taken the precaution to prevent any workman from going in to it, by placing a prominent board C at the entrance, with the word fire printed upon it. From Main body of report: The Procurator Fiscal of Kilmarnock, in this case, charged the " fireman" with culpable homicide, and culpable neglect of duty, and he was tried by Sheriff Robertson and a jury. According to the special rules of the colliery it was the duty of the fireman "to descend first in the morning, and to see that the pit and workings were apparently safe, and in a workable state, &c."
It was proved that the fireman had not been in the habit of observing this most important rule, and he endeavoured to excuse himself by asserting that he had other duties to perform, which prevented him from examining the pit daily, and he had no authority to appoint a deputy. The jury, after hearing evidence both for and against the accused, returned a verdict finding the prisoner guilty of culpable neglect of duty, and the Sheriff sentenced him to one month's imprisonment. When such cases of neglect come under my observation, I invariably point out to the public prosecutor the necessity for enforcing the special rule which provides for a careful examination of the underground works before the workmen are allowed to enter them, and that in every such case of neglect the guilty person should be punished. Though it is frequently alleged that the men transgress the special rule bearing upon this important branch of colliery discipline, by going in to their work before the fireman has completed his round of inspection, I have found from inquiry, in nearly all such cases, that the men had been in the habit of going to their work with the firemen, and had not been prevented from passing on to their working-places till after the pit was examined. It is evident that where the workmen go to their work at the same time as the fireman, if he is indifferent, or if for a considerable time he has on examination found the pit clear of firedamp, that a laxity may creep into the system and be continued for a length of time, till some unlucky morning an unsuspecting workman may rush into a body of firedamp with a naked light, and thereby destroy himself and his equally confiding companions. From my experience of these accidents (and others not resulting in loss of life) I am satisfied that the only way to prevent them is to adhere strictly to the special rule which provides for an examination of the works before the workmen are allowed to enter them; and the only sure way to carry it into effect is to provide that no person shall be allowed to go down the pit till after the fireman has made his round of examination. Such an arrangement might possibly cause the fireman to attend a little earlier in the morning, but apart from that no extra trouble or expense would be incurred. From Main body of report: This is one of the most severe falls of roof which I have had occasion to examine. The pit was being worked by the Longwall method, and it is customary where this system of working is practised, to have a distinct class of workmen (termed brushers) to take down a part of the roof, and form and secure proper roadways during the night, so as not to interfere with the men who work at the coal during the day. It would appear the deceased and others went to their work at the usual hour for "night men," and during the night four of them had met, or been engaged in one roadway, when a sudden fall of roof, 16ft x 5ft, fell unexpectedly upon them. From Main body of report: The mechanical arrangement at this colliery are very complete and the fittings in connection with the signalling apparatus are substantial and of the usual description. The deceased was bottomer, and at the time of the accident was engaged putting a hutch upon the cage preparatory to it being sent up the pit, when the cage was raised unexpectedly and he was crushed between it and side of the shaft. There were drawers close to the pit bottom at the time, who could testify that no signal had been made by the bottomer, and the peculiar situation of the bell handle prevented it being signalled by mistake. From Main body of report: A shift of men had been appointed to commence work at 1 a.m. on the morning of the accident, but the night fireman, on examining the workings of a small district previous to allowing the workmen to enter, found that a considerable quantity of firedamp had collected in it. The day fireman, on going to his shift at 6 o'clock a.m., examined the state of the ventilation with the night fireman, and it would appear they were satisfied that the firedamp was gradually getting dislodged. Sometime after this two of the work-men went forward with a safety lamp to observe the progress of the ventilation, leaving their companions behind; they had not left more than ten minutes when the firedamp was ignited. It was difficult to account for this explosion ; the persons engaged with the safety lamp had acted quite judiciously ; the firedamp had not been ignited by them ; they were not injured, neither did they see the explosion. I was of opinion the explosion had been occasioned by a naked light communicating with the gas by a "chink "in the brattice which formed the return air-course. This shows how necessary it is to act with prudence and foresight on such occasions, and how important it is to prevent naked lights from being mixed up with safety lamps where firedamp is known or suspected to exist. The explosion, though trifling comparatively speaking, resulted in the death of the fireman and an assistant. From Main body of report: This child (little more than ten years of age) had been engaged underground for about three weeks. The seam of coal being worked was divided by a stone, and the lower division or ground coal was worked first and slightly in advance. At the time of the accident, the deceased was clearing away a portion of the ground coal, when a quantity of the upper division fell upon him. An underlying seam, a few feet distant, has been worked out in this field, which has had the effect of shattering the overlying strata, and parting the stratum in immediate connection with the seam being worked. In such a waste, and where falls of coal will be of frequent occurrence, it would be prudent to exclude mere children who, though they may be able to assist in "drawing" upon an easy roadway, are quite incompetent to comprehend any premonitory sign, or indeed, under such circumstances, to protect themselves at the coal face. From Main body of report: This explosion which at first was of the most alarming description gave rise to rumours which cast a doubt upon the system of ventilation and general management of the colliery. It did not appear to me that these rumours were well founded, but as the air-courses and ventilating arrangements were all destroyed by the force of the blast, I took every precaution at the time to make myself acquainted with what had been the mode of working and general ventilation in the pit previous to the unfortunate occurrence. The pit, with some trifling exceptions, has been fitted up in the same manner it was immediately before the accident. It is divided into three divisions ; two of these form downcasts for the air, and the third is used as a general upcast. Two seams of coal were being worked, the first at 66 fathoms from the surface, and the second at 73-g fathoms. The ventilation was maintained by a separate downcast for each seam, and the " rise" division formed a general upcast for both. The workmen in the lower seam had on the morning of the accident been engaged taking down a part of the roof and brattice at the pit-bottom, which had the effect of passing the air direct to the upcast. 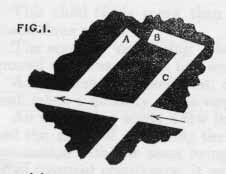 In the upper seam two men were employed driving a coal mine, to allow the air to circulate round the stoop at the bottom of the shaft, termed " forming the pitbottom " stoop." The works in either seam were limited and entirely of a preparatory description. In the upper seam, the workmen used naked lights ; they had worked from 4 o'clock in the morning till 10 o'clock a.m., when the explosion took place. Their bodies were found thirteen yards out from the face of the coal, which appears to have been the distance travelled by them after the explosion and before they were overtaken by the afterdamp. The workmen in the low seam suffered considerably from the effects of the afterdamp, but none of them were burned. They were confined below for six hours, when by the praiseworthy exertions of neighbouring workmen, a communication was made from the surface to the bottom of the shaft, and they were all brought out in safety. Though it is impossible to arrive at the facts connected with this melancholy occurrence, there can be no doubt the firedamp was generated in the upper seam, and ignited by the lights of the unfortunate men while engaged at their work. A fall of roof had some time previous to the accident deranged the aircourse by which the air was carried into the upper seam, and it was the opinion of the manager that the accident in this case had been occasioned in a similar way. I felt satisfied, however, that the alterations which had been going on at the low seam a short time before the accident happened was the direct cause, by allowing the air from the downcast to pass direct to the upcast, which would have the effect of lowering the temperature of the air in the general upcast shaft, and diminishing its effect, just in proportion as the air from the downcast (in the lower seam) passing into the upcast would be less dilated than if it had performed the circuit of the mine ; and as the air in the upcast, from the connection, approximated to the temperature of the air in the downcast, the ventilation in the upper seam would gradually be checked and become nearly stagnant, when the liberated gases mixing with the air of the mine would slowly become explosive. From Main body of report: It would appear the deceased was engaged in the pitbottom at the time of the accident putting a full hutch on the cage. From the position in which he was found (jammed between the cage and the back of the pit) he must have been either on the cage or partly at the back side of the pit arranging the hutch, and could not by accident or otherwise have touched the signal wire so as to communicate a false signal. From the examination and inquiries I made in this case, I felt satisfied that the accident was occasioned by the inattention of the engine-man in raising the cage before receiving the usual signal to do so. NB Name given in newspaper report is Henry but no death certificate for either name have been found.